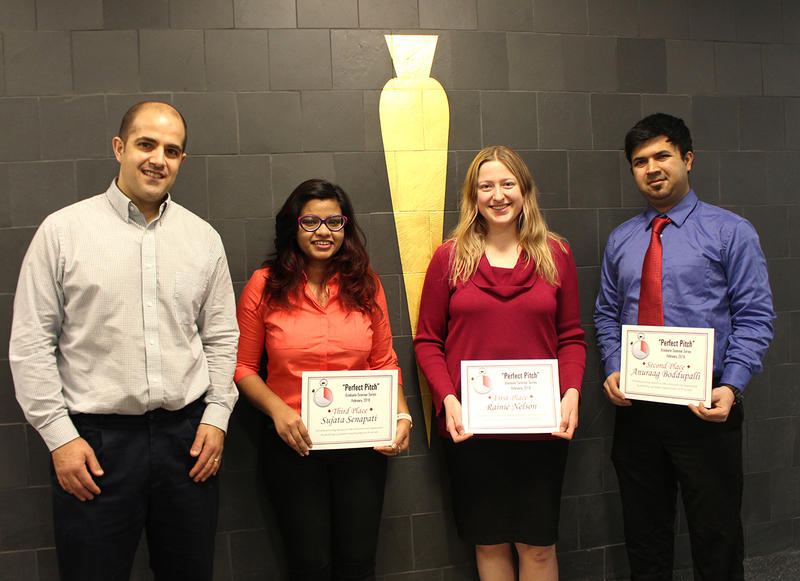 The top three graduate students in CBE’s inaugural Perfect Pitch research competition celebrate their efforts. From left: Dr. Eric Cochran, CBE Director of Graduate Education; Sujata Senapati (third place); Rainie Nelson (first place); Anuraag Boddupalli (second place). With the final tick of the 90-second timer the voting tabulations began in the Department of Chemical and Biological Engineering’s inaugural “Perfect Pitch” graduate student research competition. 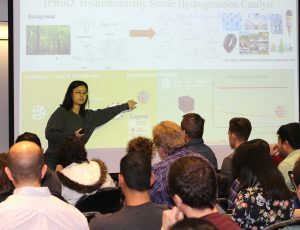 All chemical engineering graduate students were required to address the question, “So, what kind of research do you do?” in a timed, 90-second presentation with the use of one Power Point slide allowed. The presentations were done over two days before a packed lecture hall with the students’ peers, faculty members and undergraduate students who were invited to observe. More than 40 students presented. First-place finisher Rainie Nelson in her research presentation. The top three finishers are: First place, Rainie Nelson (major professor Matthew Panthani), “Novel Halide Perovskites for Optoelectronics;” second place, Anurag Boddupalli (major professor Kaitlin Bratlie), “Study of Collagen Organization in Cell-Laden Hydrogels and Animal Tissue Samples for Better Understanding of Wound Healing;” and third place, Sujata Senapati (major professor Balaji Narasimhan), “Combination Vaccine Against Influenza.” Nelson wins a cash prize of $150, $100 goes to Boddupalli and $50 to Senapati. 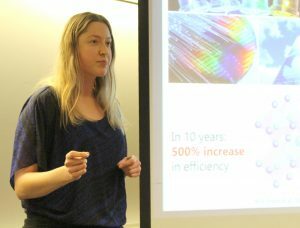 All three students will now be eligible to participate in the university-wide 3-Minute Thesis competition later in the year. The pressure was on as grad students summed up their research in 90 seconds before faculty and peers. What is the real-life problem you are addressing with your research? How does your approach uniquely solve the problem? What is the potential impact if your research is successful? Additional criteria included the quality of the visual aid and overall presentation style.